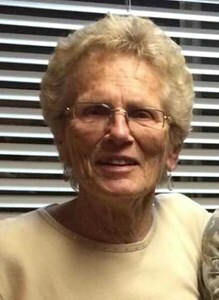 Muriel F. Hasely, 87, of New Wilmington, died on November 1 in Casper, WY where she was visiting her daughter. She passed peacefully, surrounded by loving family and “her” dog, Scout. Muriel was born August 1, 1931 in Mount Vernon, NY to Albert and Margaret French. After graduating from The Ursuline School in New Rochelle, NY, Muriel continued her education at Chatham University and then Cornell University, graduating with a B.S. degree in nursing. After graduation Muriel worked in the New York City Hospital until marrying the love of her life, Louis C. Hasely, on June 4, 1955. She had fallen in love with Louis (unbeknownst to him!) during a family vacation when she was just 14. After marriage, Louis and Muriel built a life together on a small farm outside of New Wilmington. When Louis passed away in 1988, Muriel stayed on and became even more active in the operation. She loved the farm. This former big city girl, even into her 80’s, could often be found on a tractor, fixing fence, or checking on her cattle. Muriel continued her passion for helping others by becoming a school nurse. She served many of the one room schoolhouses in the New Wilmington area and then finished her career with a long tenure as the elementary school nurse in the Laurel district. She was a longtime member of The New Wilmington United Methodist Church and volunteered with many of their functions. Muriel greatly enjoyed her annual family fishing trips to the Pennsylvania Club near San Souci, Ontario. She was barely home from one trip before she began looking forward to the next. Survivors include a daughter, Tracy (Mark) Harshman of Casper, WY; two sons, Ed (Barb) Hasely of Farmington, NM and Bill (Judy) Hasely of New Wilmington; and one loving sister, Peggy Lantz of Pfafftown, NC. Muriel had nine grandchildren, Cole (Halle) Hasely of Fairbanks, AK; Lauren Hasely of Goodyear, AZ; Steven (Kristen) Hasely of Wheatland, WY; Michael Harshman of Casper, WY; Morgan Harshman of Casper, WY; Justin (Michelle) Harshman of Casper, WY; Emily (Rob) Palmer of Juneau, AK; Craig (Maryann) Morrison of Canfield, OH; and Kim Porterfield (with her partner, Joe Fisher) of Pulaski, PA; eight great grandchildren; and one great, great grandson. She is also survived by two very special nieces, Cindy Ward of Virginia Beach, VA and Peggy Messenkopf of Winston-Salem, NC and three very special nephews, Eric Lantz of Newington, CT; Paul Bullock of Lino Lakes, MN; and Jim Bullock of Mechanicsville, VA.
Muriel is also survived by the members of The Card Club. These ladies met monthly and remained great friends for over 60 years. Members include Dorothy Kaufman and Phyrn Womer, both of Volant, and Ann Litzenberg and Eleanor Ferver of New Wilmington. Visitation will be at Smith Funeral Home in New Wilmington from 3 until 5 PM on Saturday, November 17. A memorial service will follow. Memorial contributions may be made to the New Wilmington United Methodist Church, 125 S. Mercer St., New Wilmington, PA 16142 or to the American Cancer Society. To share a special message, please click the "Share Memories" button above. Add your memories to the guest book of Muriel Hasely. I remember Muriel caringly holding me as Tracy removed a rather large fishing lure from my leg and then pronouncing that “it’s a boy” when they got it out! So sorry to hear of Muriels passing.I have missed seeing her out mowing or working in the yard when I went by. Always enjoyed discussing our nursing times with her. Rest in peace. She was an awesome lady and I loved her so much. I just quoted her in Sunday School this past week. If someone is mean to you "Kill them with kindness!" She was the nicest, kindest lady I ever knew. She taught and helped me in so many ways growing up and I always enjoyed our talks over an ice tea. She was definitely an admired lady and she will be missed. When I think about Muriel, I always think about her smile and her laugh. Bob's antics could always make her giggle. Sometimes she would even pretend to be shocked. She is missed! Muriel was fun to be around. I had a tendency to try to shock her with my humor. Most of the time I was unsuccessful. Her look told me she was winning and that I needed to bring better. Love of her family and the joys of life were all she needed. You will be missed and never forgotten.